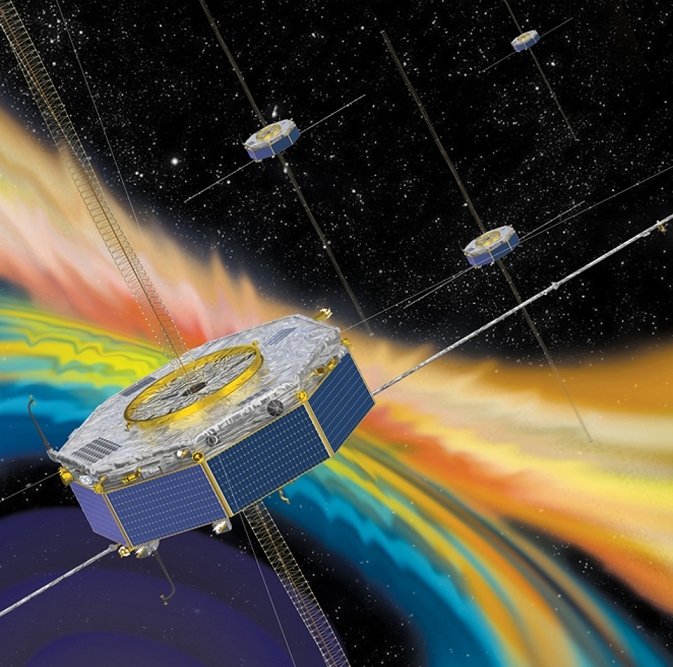 Artist rendition of the four MMS spacecraft in orbit in Earth’s magnetosphere. March 2, 2015 – Final preparations are underway for the launch of NASA’s quartet of Magnetospheric Multiscale (MMS) spacecraft, which constitute the first space mission dedicated to the study of magnetic reconnection. This fundamental process occurs throughout the universe where magnetic fields connect and disconnect with an explosive release of energy. The launch of MMS, on a United Launch Alliance Atlas V rocket, is scheduled for 8:44 p.m. MDT on Thursday, March 12 from Cape Canaveral Air Force Station, Florida. There is a 30-minute window for the launch opportunity. MMS will investigate the merging of magnetic fields, of solar and terrestrial origin, which is an integral process of space weather events. Space weather can negatively impact modern technological systems such as communications networks, GPS navigation, and electrical power grids. MMS will establish new understanding of reconnection physics, establish methods and technologies applicable to future space weather missions and contribute to the growth and development of space weather forecasting. The Laboratory for Atmospheric and Space Physics (LASP) in Boulder serves as the MMS Science Operations Center (SOC), which includes science operations planning, instrument command sequence development, and science analysis support. Science data for all MMS measurements will be hosted at LASP and centrally disseminated to the science community. LASP Director, Dan Baker, serves as the SOC lead for the Solving Magnetospheric, Acceleration, Reconnection, and Turbulence (SMART) team. LASP engineers also built several key components to the MMS FIELDS investigation instruments, which will monitor with unprecedented precision the magnetic and electric fields themselves. The spacecraft are scheduled to begin science operations in September 2015. Unlike previous missions to observe the evidence of magnetic reconnection events, MMS will have sufficient resolution to measure the characteristics of ongoing reconnection events as they occur. The mission consists of four identical space observatories that will provide the first three-dimensional view of magnetic reconnection. Because the observatories will fly through reconnection regions in a tight formation, in less than a second, key sensors on each spacecraft are designed to measure the space environment at rates faster than any previous mission. The mission observes reconnection directly in Earth’s protective magnetic space environment known as the magnetosphere. By studying reconnection in this local, natural laboratory, MMS helps us understand reconnection elsewhere, such as the atmosphere of the sun, the vicinity of black holes and neutron stars, and the boundary between our solar system and interstellar space. NASA television launch coverage begins at 6 p.m. MDT on Thursday, March 12. NASA TV will also air a pre-launch news conference at 11 a.m. MDT on Tuesday, March 10, a mission science briefing at 11 a.m. MDT on Wednesday, March 11, and a NASA Social at 1 p.m. MDT on March 12, all originating from NASA’s Kennedy Space Center.